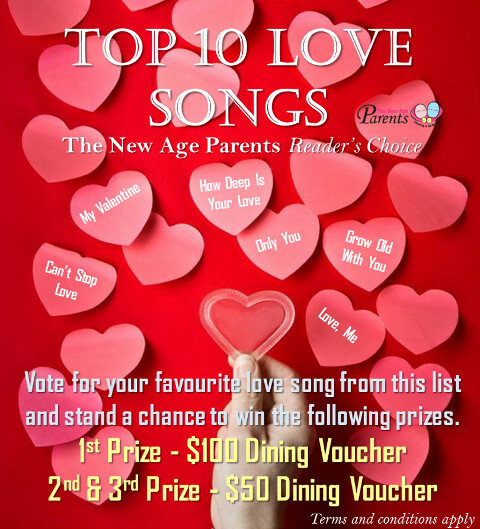 Some time back, we asked our readers to share with us their favourite love song on The New Age Parents Facebook Page. Vote for your favourite Love Song from our complied list of 20 songs and stand a chance to win dining vouchers for you and your special one. TNAP is giving away $200 worth of Dining Vouchers to 3 lucky winners! 1. Join The New Age Parents mailing list (Input your email at the top right hand corner of this page and click Subscribe). 2. Like The New Age Parents Page. 3. Fill in your particulars and vote for your song at http://woobox.com/qvifze. Do remember to use the email address you used to sign up our mailing list. 4. Comment and share this post for bonus chances to win. Hurry! Contest ends 25 Feb 2014.